Description: The RV Resort at Carolina Crossroads for camping directly behind this theater complex. Our brand-new all pull-thru park offers modern amenities such as FREE wi-fi internet access, concrete pads, 30/50 amp hook-ups, water and sewer at each site. The RV Resort at Carolina Crossroads is conveniently located less than a mile off Interstate 95 in Halifax County, the "Birthplace of Independence." Take exit 171, head 125 south, take your 1st left in front of the Hilton Garden Inn at the Carolina Crossroads Blvd stoplight, stay right at the traffic circle Park is located a half mile on your right. Pros: All sites are large rig friendly sites, owner is on-site and very friendly. We stopped at this campground on our way from Florida to DC area, it is a nice half day drive from DC and very conveniently located about a mile off I-95. We found the listing in Passport America and was very pleasantly surprised to find an outstanding new park with all amenities as advertised. The owner is in the process of building a new club house, sites are all large and easy to get on and off. Free Wi-Fi through out the park. We would definitely stay at this park again. 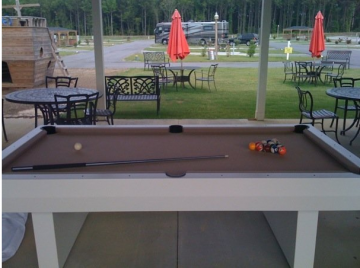 Pros: Sites are large and all facilities are available and fairly new! Everything operates! Cons: There seemed to be little for children but that will change when the clubhouse and pool are completed! 'Stumbled' across this park while traveling from Baltimore to New Bern, NC. Made it a point use it as an overnight stay on the return trip and could not have been more pleasantly surprised! The facility is still in the development stage (clubhouse & pool) but the necessities are there. Great pull through spots with full power, sewer and free wi-fi. Owners are accommodating and if you arrive after hours the telephone answering service has a recorded message that says come on in, there are plenty of spots available (there are) and they will catch up with you in the morning! If you do not call and get this message but still arrive after hours, there are written instructions pointing out a line of 'express' pull-throughs reserved just for those arriving after hours! We will be staying there again! We looked forward to this easy going, quiet, well maintained campground. We overnighted here often - after 6pm just put your $25 fee in an envelope and drive to an open spot. Price increased to $30 for a couple years, but now at $45 we will just move on. This campground started out as a very economical stopping point on our way to Florida. It was a Passport America Park with reasonable rates. Maybe ownership has changed with the resulting massive increase in price. I will go on down the road and find a more economical alternative.